Mycosis fungoides is the most common form of cutaneous T-cell lymphoma and comprises 4% of all non-Hodgkin lymphomas. It is characterized by the proliferation of mature, effector-memory T-cells in the skin. Lesions initially present as patches and may progress to plaques, tumors and erythroderma. The disease may spread to the viscera and bloodstream. Mycosis fungoides presenting in head and neck mucosal sites is exceedingly rare. These lesions most often appear after cutaneous involvement, and progression to these areas often indicates a grave prognosis.1 To date, 57 such cases have been reported in the literature. Here we present 2 additional cases treated in our institution, together with a comprehensive review of the literature. A 59-year-old Caucasian woman presented to the Cutaneous Lymphoma Clinic of the Department of Dermatology at our institution with a generalized pruritic erythematous rash and lesions consistent with tumors on her right upper extremity and chest. She had a 4-year history of a rash first localized to her palms that had spread to several cutaneous sites, notably the gluteal folds and inframammary areas. Although originally diagnosed as having pustular psoriasis, biopsies of the right upper extremity and right chest lesions were consistent with mycosis fungoides. Hematopathology did not reveal any disease in her blood and she was diagnosed with stage IIB (T3N0M0Bx) disease. Immunohistochemistry of the biopsy specimen revealed an infiltrate that was CD2+, CD3+, CD5+, CD4-/CD8-, CD7-, and CD56-, with TCR-beta F1+ phenotype. T-cell receptor gamma gene rearrangement was positive for a clonal T-cell population. The patient initially underwent total skin electron-beam therapy to a total dose of 36 Gy delivered in 24 fractions of 1.5 Gy each using the 6-dual-field irradiation technique.2 During this period, she reported symptoms of a dry and sore throat as well as odynophagia. Esophagogastroduodenoscopy by an outside gastroenterologist revealed signs of reflux, and she began taking Lansoprazole (Prevacid, Takeda Pharmaceuticals USA, Deerfield, Illinois) 30 mg twice daily, which offered short-lived mild relief. A barium swallow revealed an unremarkable esophagus. Upon further evaluation in the Department of Otolaryngology, areas of inflammation consistent with laryngeal and oropharyngeal candidiasis were identified, and she received treatment with oral fluconazole for 4 weeks. Although the candidiasis resolved at that time, the patient continued to complain of persistent symptoms that were worse after meals and at night. Re-examination of her throat showed an irritated appearance of the posterior soft palate, uvula, and anterior tonsillar pillars (Figure 1A). Flexible nasopharyngolaryngoscopy revealed irritated mucosa diffusely on the epiglottis and arytenoids bilaterally with a similar appearance along the left lateral pharyngeal wall. Biopsy specimens from the uvula and epiglottis revealed lesions consistent with her previously diagnosed mycosis fungoides including an identical TCR-gamma clone. Immunohistochemistry demonstrated an infiltrate positive for CD2, CD3, CD5, CD43 and weakly positive for beta-F1. Infiltrates were negative for CD56, CD30, and CD20. Positron emission tomography and computed tomography (PET/CT) scans showed no involvement of her viscera and mild fluorodeoxyglucose (FDG) uptake of an SUV of 2.3 in her axillary and inguinal lymph nodes. The oropharyngeal and laryngeal lesions were treated with 6-MV photons using an intensity-modulated radiation therapy (IMRT) technique. The initial planned dose was 30.6 Gy to be delivered in 17 fractions. However, she developed confluent fibrinous mucositis (grade III) and severe odynophagia, which required multiple breaks in treatment, significantly prolonging treatment duration. Ultimately, we terminated her treatment at a dose of 20.8 Gy. Two years after treatment completion, the patient has had no local recurrence of her mucosal lesions. She has subsequently undergone external-beam radiation therapy on multiple occasions for localized skin lesions. She continues to follow up with dermatology and radiation oncology. A 69-year-old Caucasian man was diagnosed with cutaneous mycosis fungoides 10 years prior to his presentation to our institution. At the time he was seen in the Department of Dermatology, he noted a 2-month history of new leather-like lesions on his bilateral extensor elbow surfaces. He also had multiple exophytic nodules on his bilateral lower and upper extremities, in addition to plaques on his torso and all 4 extremities. The mycosis fungoides lesions on his scalp had been treated with radiation therapy 5 years earlier, with no recurrence at those sites. He had also received intermittent psoralen and ultraviolet A (PUVA) light therapy and methotrexate until 3 years prior to presentation. At consultation, he was taking bexarotene (Targretin, Valeant Pharmaceuticals International Inc., Laval, Quebec, Canada) 75 mg 3 times daily in addition to using triamcinolone 0.1% cream daily. A biopsy of one of the new lesions revealed marked pseudoepitheliomatous hyperplasia with dermal granulomatous inflammation. Culture of the lesions revealed staphylococcus aureus, and he began receiving daily intravenous vancomycin 1 gm for 30 days with minimal improvement. Another biopsy taken from the left forearm lesion demonstrated cutaneous T-cell lymphoma with pseudoepitheliomatous hyperplasia, a positive monoclonal T-cell rearrangement and a CD3+, CD4+, CD8+, and CD30- phenotype. PET/CT showed no metabolic disease at any site. The patient was treated with total skin electron-beam therapy to a total dose of 36 Gy using the technique described above. Shielded areas, including the palms, soles and buttocks, received a boost of 8 Gy in 1 fraction. This was followed by 4 cycles of weekly pralatrexate 15 mg/m2. Although this treatment initially appeared beneficial, several weeks later the patient presented with new lesions on his torso, extremities, and on the left tonsil and alveoli (Figure 1B). Biopsy of the left soft palate and left superior alveolar ridge again was consistent with mycosis fungoides. The oral lesions were treated with external-beam radiation therapy to a prescribed dose of 30.6 Gy in 17 fractions. However, the patient received only 10 fractions for a total dose of 18 Gy due to severe mucositis, which was not relieved by sucralfate, and eventually required hospitalization due to significant decreased oral intake and failure to thrive. His treatment was discontinued at this dose. Although the oral lesions responded well to the therapy, he eventually began a regimen of cyclophosphamide, hydroxyduanorubicin, etoposide, vincristine, and prednisone (CHEOP) chemotherapy and intrathecal methotrexate due to overall disease progression, including involvement of his bone marrow. Unfortunately, our patient succumbed to disseminated disease after receiving a single cycle of CHEOP. We performed a PubMed search for articles in English containing the following key words: mycosis fungoides, cutaneous T-cell lymphoma, oral cutaneous T-cell lymphoma, oral mycosis fungoides, oropharyngeal mycosis fungoides, and treatment of oral mycosis fungoides. Articles describing patients with only cutaneous manifestations of mycosis fungoides were excluded. Only reports of cases of head and neck mucosal mycosis fungoides were included for analysis. Additional cases were identified by reviewing and evaluating the references in articles retrieved from our PubMed search. Since many case reports provide only the age of the original diagnosis, we estimated the exact age of a given patient at the time of head and neck mucosal manifestations using the time frame given in the reports. All but 6 patients were previously diagnosed with cutaneous mycosis fungoides prior to head and neck mucosal presentation. Based on the limited information from prior publications, we were able to estimate the duration from initial cutaneous presentation of mycosis fungoides to mucosal involvement in 30 of the 53 patients (this excludes the 6 patients who presented initially with oral/oropharyngeal disease). These periods ranged from 1 month to 21 years (Table 1). The mean time was 5.7 years, with a median time of 4 years. Atypical lymphocytes exhibiting cerebriform and indented nuclei were described in most biopsy specimens. Pautrier microabscesses were also noted in some reports. 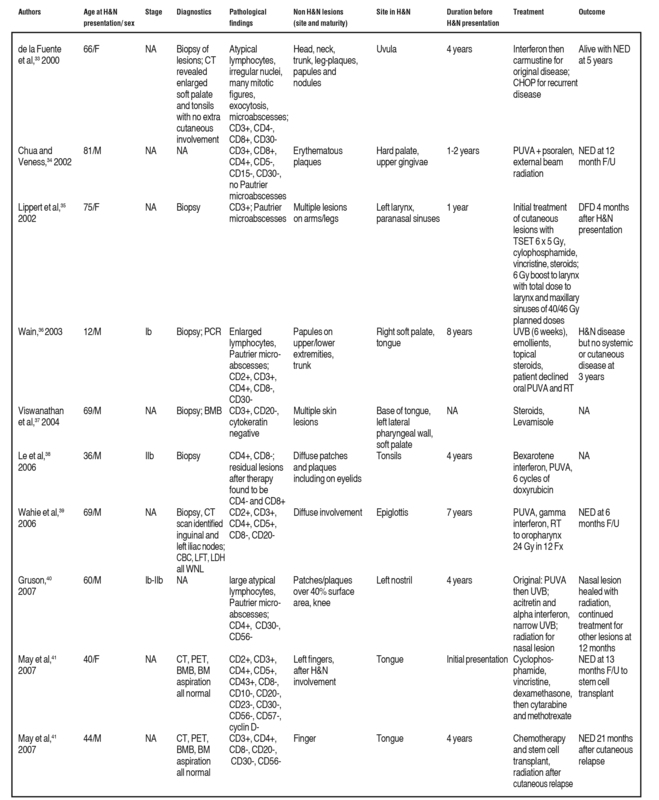 When examining cellular markers, 12 patients were CD4+, a common finding in mycosis fungoides.1,33,34,36,38-42 Of these, 7 were CD4+/CD8-1,33,38,39,41,42 and 3 were CD4+/CD8+.34,43,44 Three were CD4-/CD8+1,33 and only 1 patient was CD4-/CD8- (case 1 of this report), a rarity. Although head and neck mucosal mycosis fungoides was noted in a wide array of anatomical sites, the most common sites for disease presentation were the tongue (n = 25, 42%) and hard or soft palate (n = 18, 31%). Other sites of disease were (in descending order of frequency) gingiva, epiglottis, buccal mucosa, tonsils, and lips. The treatment modalities of 36 patients were described. Of these, 26 patients received some form of radiation, including total skin electron-beam therapy and/or local field radiation therapy. Based on the information in the published reports, at least 18 patients received external-beam radiation therapy to their mucosal lesions. An additional 2 patients were prescribed radiation, but either declined or died before receiving radiation therapy. Prescribed doses to mucosal lesions included 65 Gy in 32 fractions, 36 Gy in 15 fractions, 30.6 Gy in 17 fractions, 27 Gy in 9 fractions, 24 Gy in 12 fractions, and 4 Gy in 1 fraction. We initially prescribed 30.6 Gy in 17 fractions to both of our patients; however, neither one could complete the entire treatment due to severe toxicities. Only 2 patients were reported to have undergone surgical tumor debulking. Information regarding follow-up was available for 35 (59%) patients. Of these, 24 died; however, it should be noted that not all deaths were related to mycosis fungoides. The time from head and neck mucosal presentation to death in these patients ranged from 1 month to 8 years, with a mean of 1.7 years and a median of 1 year. Fourteen patients were alive at last known follow-up, which ranged from 1 month to 5 years. Of these, 7 had no evidence of oral or cutaneous disease at follow-up. Our patients both experienced severe mucositis during their treatment regimens. 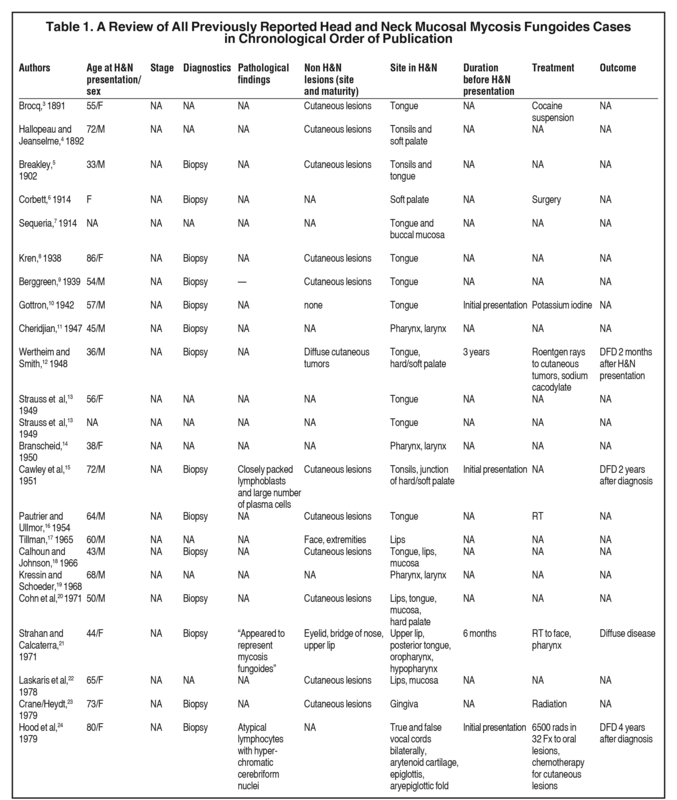 Reynolds et al similarly reported a patient with mucosal irritation after receiving 3000 rads to the entire oral cavity; this resolved with conservative therapy.25 Other publications in our review did not report these or other similar treatment side effects. It is, however, important to consider these toxicities during treatment planning and to recognize them as possible impediments to treatment completion. Predominantly a cancer of the skin, mycosis fungoides presenting in the oral cavity and oropharyngeal mucosa is uncommon. A review of the previously reported 57 cases and 2 new cases at our institution shows that head and neck mycosis fungoides is a rare and late manifestation of the disease and carries a poor prognosis. External-beam radiation therapy is the most common treatment modality. Toxicities can include severe mucositis and can delay or prevent full treatment regimens. Sirois DA, Miller AS, Harwick RD, et al. Oral manifestations of cutaneous T-cell lymphoma. A report of eight cases. Oral Surg Oral Med Oral Pathol. 1993;75:700-705. Task Group 30 Radiationtherapy Committee, American Association of Physicists in Medicine. AAPM Report No. 23: Total Skin Electron Therapy: Technique and Dosimetry. New York: American Institute of Physics; 1987. Brocq L. Cas de mycosis fungoides. Ann Dermatol Syph. 1891;2:583-597. Hallopeau H, Jeanselme E. Un case de mycosis fungoides avec gangrene progressive. Bull Soc Franc Dermal Syph. 1892;3:496-502. Breakey WF. A case of mycosis fungoides. J Cutan Dis. 1902;20:316-334. Corbett D. A case of mycosis fungoides. Brit J Dermatol. 1914;26:366-367. Sequeira JH. Discussion on mycosis fungoides. Proc R Soc Med. 1914;7:190-204. Kren. Mycosis fungoides, a ile Stadien zeigende Zungenknoten. Derma tol Wochenschr. 1938;106:169. Berggreen P. Verlaufsweisen der Mycosis fungoides. Archiv für Dermatologie und Syphilis. 1939;178:501-549. Gottron H. lsolierte Mycosis Fungoides der Mundschleimhaut. Zentralbl Hautkrkb. 1942;68:614-615. Cheridjian Z. Mycosis Fungoide du pharynx et rhino-pharynx lateral chez un sclerodermique. Schweiz Med Wschr. 1947;77:366. Wertheim L, Smith GS. Mycosis fungoides. Arch Derm Syphilol. 1948;57:625-635. Strauss MJ, McCarthy FP, Kennedy BJ, et al. Discussion of cases of mycosis fungoides. Arch Derm Syphilol. 1949;60:929-930. Branscheid F. Mycosis fungoides des Verdauungskanals ohne Miterkrankung der Haut. Dermatol Wochenschr. 1950;121:319-324. Cawley EP, Curtis AC, Leach JEK. Is mycosis fungoides a reticuloendothelial neoplastic entity? Arch Derm Syphilol. 1951;64:255-272. Pautrier LM, Ullmo A. Mycosis fungoide, s’accompagnant de tumeur linguale. Bull Soc Franc Derm. 1954;61:67. Tillman HH. 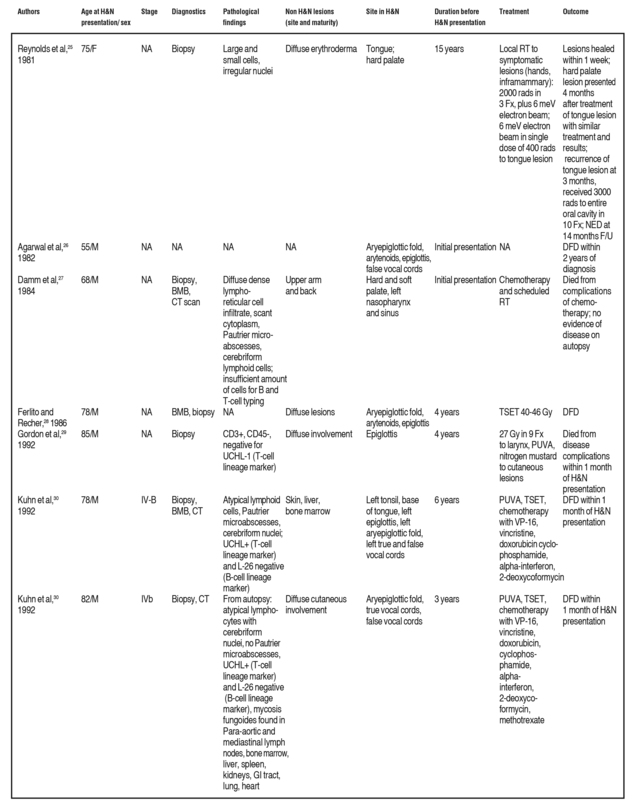 Malignant lymphomas involving the oral cavity and surrounding structures. Report of twelve cases. Oral Surg Oral Med Oral Pathol. 1965;19:60-72. Calhoun NR, Johnson CC. Oral manifestation of mycosis fungoides: report of a case. Oral Surg Oral Med Oral Pathol. 1966;22:261-264. Kressin J, Shoeder HJ. Mycosis Fungoides der Schleimhaut. Z Hals Nasen Ohren Heild. 1968;16:261-264. Cohn AM, Park JK, Rappaport H. Mycosis fungoides with involvement of the oral cavity. Arch Otolaryngol. 1971;93:330-333. Strahan RW, Calcaterra TC. Otolaryngologic aspects of mycosis fungoides. A case report. Laryngoscope. 1971;81:1912-1916. Laskaris GC, Nicolis GD, Capetanakis JP. Mycosis fungoides with oral manifestations. Oral Surg Oral Med Oral Pathol. 1978;46:40-42. Crane RM, Jr., Heydt S. Gingival involvement in mycosis fungoides: report of case. J Oral Surg. 1979;37:585-587. Hood AF, Mark GJ, Hunt JV. Laryngeal mycosis fungoides. Cancer. 1979;43:1527-1532. Reynolds WR, Feldman MI, Bricout PB, et al. Mycosis fungoides in the maxillary sinus and oral cavity: report of two cases. J Oral Surg. 1981;39:373-377. Agarwal NK, Gupta S, Gupta OP. Mycosis fungoides of the larynx. Asian Med J. 1982;25:180-184. Damm DD, White DK, Cibull ML, et al. Mycosis fungoides: initial diagnosis via palatal biopsy with discussion of diagnostic advantages of plastic embedding. Oral Surg Oral Med Oral Pathol. 1984;58:413-419. Ferlito A, Recher G. Laryngeal involvement by mycosis fungoides. Ann Otol Rhinol Laryngol. 1986;95:275-277. Gordon LJ, Lee M, Conley JJ, et al. Mycosis fungoides of the larynx. Otolaryngol Head Neck Surg. 1992;107:120-123. Kuhn JJ, Wenig BM, Clark DA. Mycosis fungoides of the larynx. Report of two cases and review of the literature. Arch Otolaryngol Head Neck Surg. 1992;118:853-858. Redleaf MI, Moran WJ, Gruber B. Mycosis fungoides involving the cervical esophagus. Arch Otolaryngol Head Neck Surg. 1993;119:690-693. Harman M, Akdeniz S, Arslan A, et al. Mycosis fungoides with involvement of the oral cavity. J Eur Acad Dermatol Venereol. 1998;10:253-256.
de la Fuente EG, Rodriguez-Peralto JL, Ortiz PL, et al. Oral involvement in mycosis fungoides: report of two cases and a literature review. Acta Derm Venereol. 2000;80:299-301. Chua MS, Veness MJ. Mycosis fungoides involving the oral cavity. Australas Radiol. 2002;46:336-339. Lippert BM, Hoft S, Teymoortash A, et al. 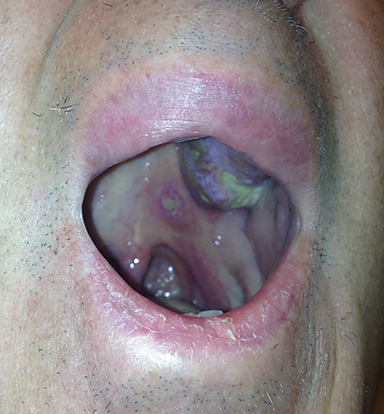 Mycosis fungoides of the larynx: case report and review of the literature. Otolaryngol Pol. 2002;56:661-667. Wain EM, Setterfield J, Judge MR, et al. Mycosis fungoides involving the oral mucosa in a child. 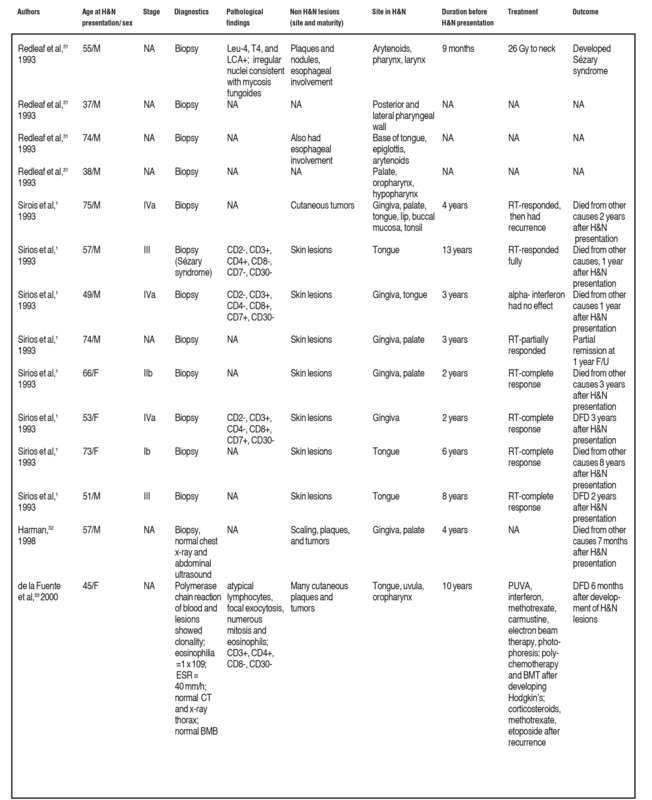 Clin Exp Dermatol. 2003;28:499-501. Viswanathan N, Nair RM, Nair RA. Cutaneous T cell lymphoma with multiple oral lesions. Indian J Otolaryngol Head Neck Surg. 2004;56:311-314. Le BT, Setlur J, Sikora AG, et al. Mycosis fungoides: a case of tonsil involvement. Arch Otolaryngol Head Neck Surg. 2006;132:794-796. Wahie S, Lucraft HH, Hartley C, et al. Oropharyngeal mycosis fungoides. Clin Exp Dermatol. 2006;31:821-822. Gruson LM, Heller P, Hemmerdinger SA, et al. Mycosis fungoides involving the nasal mucosa. J Am Acad Dermatol. 2007;56:S112-114. May SA, Jones D, Medeiros LJ, et al. Oral-cutaneous CD4-positive T-cell lymphoma: a study of two patients. Am J Dermatopathol. 2007;29:62-67. Maleki Z, Azmi F. Mycosis fungoides of the true vocal cord: a case report and review of the literature. Arch Iran Med. 2010;13:429-431. Goldsmith SM, Seo BL, Kumara de Silva R, et al. Oral mycosis fungoides: report with immune profile. Oral Surg Oral Med Oral Pathol Oral Radiol. 2014;118:e48-52. Postorino M, Pupo L, Provenzano I, et al. A case of oral mycosis fungoides successfully treated by combination of alemtuzumab and chemotherapy. Ann Hematol. 2016;95:153-154. Hodak E, David M, Maron L, et al. CD4/CD8 double-negative epidermotropic cutaneous T-cell lymphoma: an immunohistochemical variant of mycosis fungoides. J Am Acad Dermatol. 2006;55:276-284. 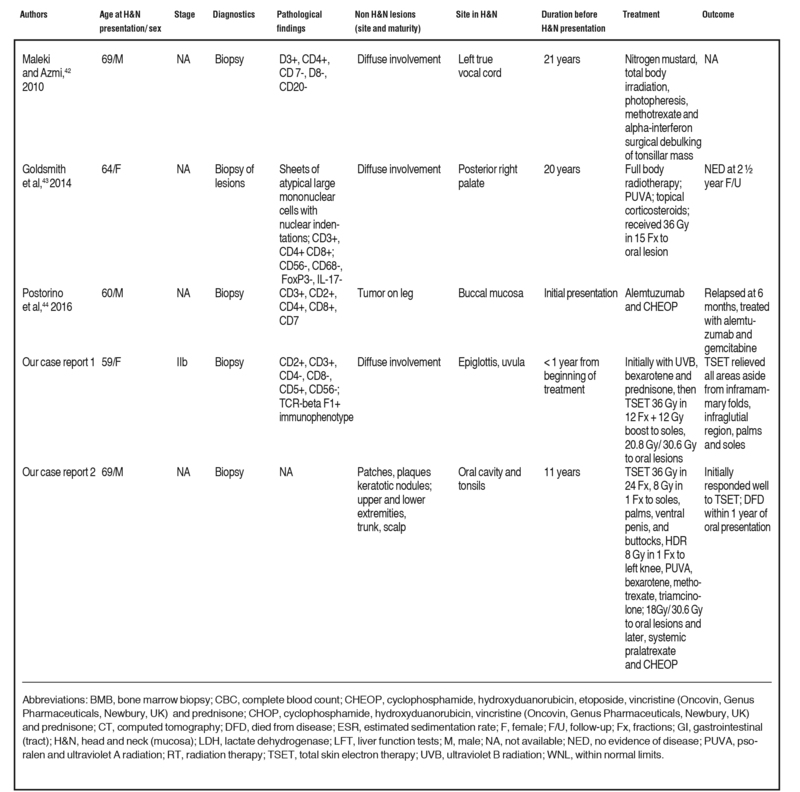 Feldman AM, Sevak P, McHargue C, Lim HW, Siddiqui F. Mycosis fungoides involving head and neck mucosal sites: Review of the literature. Appl Rad Oncol. 2017;6(2):11-19. Dr. Feldman and Dr. Sevak are residents, Department of Radiation Oncology; Dr. McHargue is a senior staff physician, Depratment of Dermatology; Dr. Lim is chairman, Department of Dermatology; and Dr. Siddiqui, is vice chair of operations and director of Head and Neck Radiation Oncology, Department of Radiation Oncology, Henry Ford Hospital, Detroit, Michigan.